A broader impact of the deep involvement of China in social media is that some users do not know the Internet through social media platforms. This is partly due to the large population of new users coming online at a given time. According to the Internet Network Information Center of China, China had 420 million Internet users in the first half of 2010, up 36 million Internet users over year end 2009. When new users join the Internet, often a friend to present a particularly appropriate service, such as how to communicate with your friends for free via Sina Weibo purchase goods or E-Bay China Taobao so that the service becomes their concept of the Internet. These examples show how Chinese Internet users would not distinguish between social media and the Internet itself. For them, the Internet is a social media and vice versa. At the end of December 2014, China had 649 million Internet users, 56.9 million more than the previous year, representing nearly 55% of Chinese people! As the largest online community in the world continues to grow, Chinese social media sites have become popular tools to reach Chinese consumers. “Weibo” is the Chinese word for “microblog”. 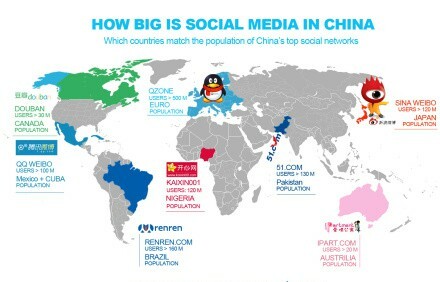 Known as the “Chinese Twitter”, Sina Weibo is actually much more than that – it has two times more users than Twitter, and is used by more than 22% of the population of Chinese Internet almost 540 million people! Sina Weibo was well ahead of the game by offering users the ability to embed images and videos – well before its Western counterpart, Twitter. Some differences between Chinese and foreign social media is rooted in the culture and language. At first glance, Sina Weibo microblog is a latecomer to the phenomenon. But launched in 2009, almost three years after Twitter, Sina Weibo is by far the most popular microblogging platform in China. (The PRC government has blocked Twitter, but a small number of Chinese expatriates and residents hack their way around the obstruction.) Similar to Twitter, Sina Weibo allows users to post 140-character messages, and users can follow friends and finding interesting comments posted by others. Small but significant differences in the platform have some say he is a Twitter clone, but better. For example, unlike Twitter, Sina Weibo allows users to post videos and photos, comment on the updates of others, and easily add comments when publishing the message from a friend again. Although mobile phones are used to send less than 20 percent of Twitter updates in the US, nearly half of updates Sina Weibo are sent via the mobile phone. This phenomenon highlights the growth of mobile Internet in China, one of the biggest trends in China and Asia. And just like Hollywood celebrities to connect with their fans via Twitter, Weibo depend Chinese celebrities and even some world famous spirit jumped at the opportunity to connect with their Chinese fans through Sina Weibo. Lebron James and Kobe Bryant are two of the most influential global celebrities in Chinese social media, and they are both Sina Weibo active users. After the establishment of a Sina Weibo account last month, Kobe Bryant had more than 100,000 followers within hours. QQ is an abbreviation of Tencent QQ, a popular instant messaging service. Last September, there were 784 million active user accounts with approximately 100 million line at a time. According to the Alexa internet ranking, the QQ webisite 8th. 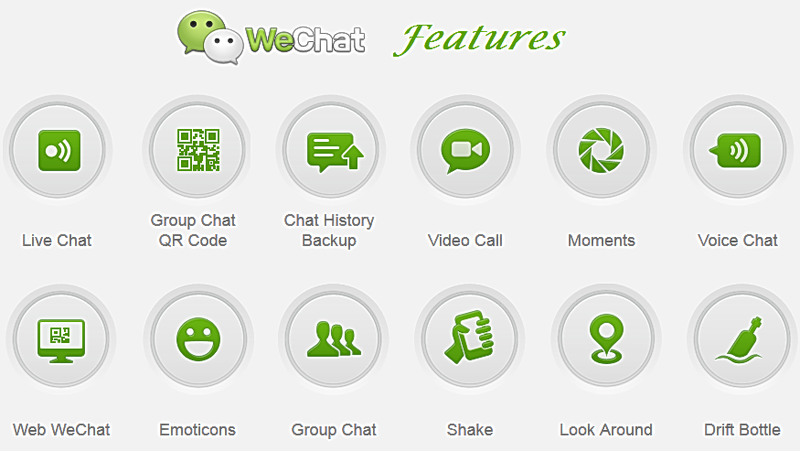 WeChat – is a voice and text mobile. With social features like “friend finding,” you can chat with friends via voice, text or images. You can also create group conversations with several friends to discuss together. It has over 100 million users. A team at BuzzFeed, the news and entertainment site, Knew It Had struck gold When It cam across DECADE-old photo of Dwayne Johnson, the muscle bound wrestler and film star Known As The Rock, wearing a fanny pack and dated bluejeans. To drum up more attention the team changed the picture’s background to a holiday theme and added “Rockin ‘around the Christmas Tree” in big lettering. Goal Then, , the team uploaded it to Instagram, the hugely popular photo-sharing service. Image Then Took on a life of icts own, reposting the picture to His Own Instagram account. Nearly 390,000 people Indicated They liked the post, and the picture Became the top topic of discussion on the message board website Reddit. BuzzFeed’s tactics Could aussi offer a glimpse into how Some personal messaging apps like Instagram, WeChat and Snapchat – already used by millions of people sharing text or pictures among friends – will be used in the future. Some publishers, game makers and e-commerce companies are using the apps as a new distribution platform and moneymaking. Developers-have-been Expanding the uses of the apps, making new functions possible. And investors, seeing huge potential, driven-have apps to the ever-Higher valuations. The initial appeal of the apps is easy. They are faster to use than email, And They Generally allow you to send text, links, video and pictures to friends more cheaply than traditional texting services offert by wireless carriers like Verizon or AT & T.
The uses are Multiplying, though. On the app KakaoTalk, for example, people can discover new –other smartphone apps and share ’em with Their friends. We Snapchat, users can send money to one Reviews another inside the app. And Line, a popular messaging app in Japan, lets people pay for things at brick-and-mortar retail stores using Pay Line, the company’s payments service. Soon, media outlets like ESPN, CNN Vice and will be glad original publishing directly to a new editorial section in Snapchat, selon people familiar with the matter Who spoke on condition of anonymity of Because They Were not authorized to speak Publicly. Now, 40 percent of Mobile Subscribers in the United States use an instant messaging app on Their phones at least once a month, data from selon comScore, a research firm. Globally, the use of mobile messaging apps Grew 103 percent During 2014, selon Flurry, a mobile analytics firm. Some of the Most Popular options are Viber, qui says it HAS more than 200 million monthly visitors; Line, Japan’s Most Popular messaging app, with 170 million users; and WhatsApp, the leading service more than 700 qui HAS million regular visitors. For now, though, not all of the apps are big Generating revenue. WhatsApp, qui est owned by Facebook, just reported about $ 10.2 million in sales in 2013. The cam back from the small fraction of users Who paid $ 1 to use the app. paid $ 21.8 billion for WhatsApp in February. For investors, the thesis is a Silicon Valley adage: Get millions of people to use the services first, and Eventually it will find a way to make money. 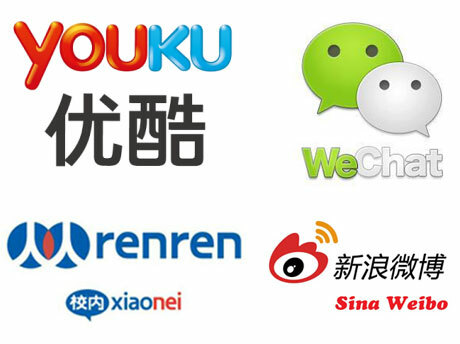 Many entrepreneurs see WeChat, the hugely popular Chinese services run by the Internet giant Tencent, as the ideal model for building a business in messaging. Released four years ago, the app now claims Nearly 500 million monthly active users – who not only send picture-laden messages, play games and order book car rides and plane tickets. The rapid growth in messaging apps, some say, has-been a response to the more public kind of popular apps like Twitter and Facebook status updates and posts Where are visible to the Many Rather than the few. “It’s a much more intimate experience,” Said Marissa Campise, a partner at Softbank Capital, the venture arm of Japanese telecom giant Softbank. “Messaging apps are smaller and less visible than the public networks and far more engaged and trusted. Often it feels like a more controlled, real-time replacement for email, “she said. Messaging users tend to pick up on average Their phones several times an hour, Talmon Marco, Viber of the chief executive, in an interview Noted late last year. That Makes messaging apps an ideal place to Introduce –other offerings like games, virtual or physical goods Even stickers. Asia has-been a fertile breeding ground for PARTICULARLY Expanding the uses of the apps. In 2013, for example, joined WeChat Xiaomi, the Chinese smartphone giant, to offer a limited quantity of the company’s newest phone for purchase on the chat app. Users Could reserve And Then buy the new smartphone Entirely inside the app using WeChat Tenpay, the payments services owned by Tencent. Xiaomi Said it sold 150,000 phones in less than 10 minutes. The app WeChat is one of the biggest hubs for Chinese Consumers to find new mobile games. Last quarter, Tencent’s mobile games revenue alone Was 2.6 trillion renminbi, or about $ 420 million. Each June, Chinese censors Typically seek to scrub mentions of numbers deemed sensitive at this time of the year: 89 for 1989 the year of the Tiananmen Square crackdown on pro-democracy protesters in Beijing; 6.4 and 64 gold for June 4, the specific day it Took Place. On China’s popular Weibo microblogging platform, searches for the numbers 8964, 6.4, 1989.64 and so on return no results, and users are greeted with a Post That says “selon the relevant laws, règlements and policies,” the search results “have not beens displayed. “Censorship of That Ilk has come to be expected on the anniversary. This year, in addition to Such controls, it Appeared That China’s online games and social networking giant May-have taken a new step in Adhering to censorship requests. On Wednesday, some users of Tencent Holdings Ltd.’s payment service WeChat reported about being white Unable to make money transfers or send out “lucky money” envelopes of water equivalent electronic cash Containing the sensitive numbers. Some users Trying to send out water equivalent Such As 6.4 yuan, 64 yuan or 89.64 yuan received Messages That said: “Transaction error. Try again later. “Payments of –other water equivalent Were Apparently successful, HOWEVER. Ted Livingston, the chief executive of the messaging app Kik, based in Canada, Has argued That younger users are coming of age in a world Where Their portal to the Internet has-been the smartphone, And They are more willing to try new forms of commerce and discovery. Baimage, the French celebrity, who doesn’t know how to speak Chinese and yet jokes in Chinese came to Shanghai.This year, in Paris the show man performed already three times and received wide acclaim. First, it came from the French part of the audience because of the challenge. Indeed, performing in front of a crowd, in Chinese without having studied it before is a big one. Chinese however, respected his mastery of the Chinese tones and his jokes. They were strongly tied to the Chinese culture and funny, truly a feat for someone unfamiliar with their culture. What’s his goal this time? He wanted to finally meet his audience for real, in their country before performing later this year. Let’s take pictures together, shall we? Upon his arrival, his fame was not so big, he therefore decided to gather people and take pictures with them to make himself known to the Chinese in Shanghai, as a start. This operation was a success! A video that went viral! His weibo account increased up to 160000 followers. The buzz went around the Chinese internet and generated 550000 views and 500 comments! Below are a few of them, expressing the amazement of the people there. Before long, the people who take photo will around the earth in a circle. God! Everybody take a photo! That’s how Bai Ma Ge used a buzz to quickly make himself known to prepare his next coming very soon. Dear, Chinese readers, would you go to see him?